Today I'm playing with Waltzingmouse Sketch Challenge #76 with a project I've never done before! Before we move on to my project, here's the great sketch for this week! Inspired by the sketch, I decided to do a variation of a photo glass ornament. For those of you not familiar with these ornaments, they are made with the empty glass ornaments you can find at any craft store. 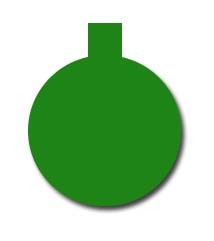 Here's the quickie version of how they are put together: Cut a clear piece of plastic (like a transparency) in the shape below (adjust the width to fit the size of your ornament). Glue your image to the cut transparency. Carefully roll the transparency and slip it into the top of the ornament (the tab part will stick out the stem and keep it from shifting). Coax the rolled transparency open with a pair of tweezers. Add the snow and pop the hanger back on. Instead of a photo, I used stamped, colored, and fussy-cut pieces from the WMS Cottage Home set. The cottage seemed lonely so I added two Christmas trees from a PTI set. For coloring, I used traditional greens and reds. I couldn't decide which type of snow I liked best, so I used a mix of two types of snow that I found at Michaels. One type is fluffy and the other type is flaky and iridescent. Because the stamped images are glued to a clear transparency, the back side was not looking pretty. I could have left it blank, but I decided instead to stamp, color, and fussy-cut another set of images. This time I used a completely different color scheme just for fun! 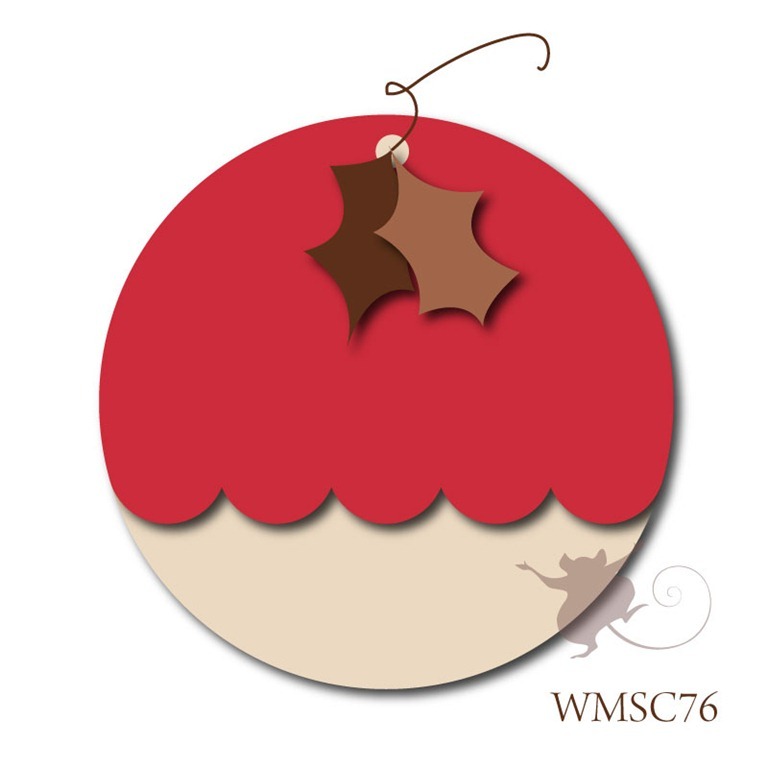 To match the WMSC sketch, I added die cut holly leaves and berries on each side of the ornament. This project is fairly easy, but be warned that the snow will get everywhere. That stuff is worse than glitter! I'm off to vacuum myself off and then it's to bed for me. Thanks for visiting and enjoy the rest of your weekend! JJ, I don't think you've ever posted anything that didn't make me gasp "Oh my god! That's gorgeous!" Even if the snow did get everywhere (worse than glitter? Didn't even know that was POSSIBLE! lol) the final project looks well worth it. It's amazing, and what a unique and fabulous take on a circular sketch! JJ, this one's really beautiful! Love the glass ornament and what you put in it. How nice the trees beside the cottage. Gives a really x-mas feel to it! This looks like a winner. JJ, what Awesome projects!! 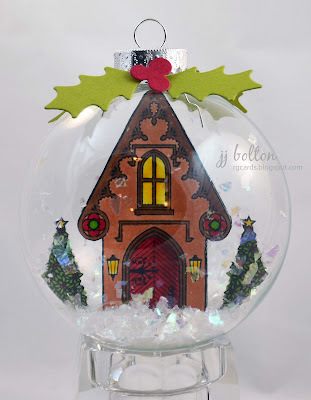 Love the ornament and the house does sit so nicely in the bauble. LOVE the idea!! What an incredibly gorgeous ornament!! Wow JJ this is so awesome! What a brilliant idea! Love how it looks like a snowglobe scene complete with snow and trees! I think you nailed this one! I honestly don't think I will even try this sketch this week! I can not imagine coming up with an idea even remotely as creative or perfectly executed as this one. This is gorgeous and to think you did both sides? That was the smartest thing...ever! Just beautiful. You have such talent! Just Kidding! JJ this is SUCH a wonderful idea for Claire's sketch and so perfectly created! 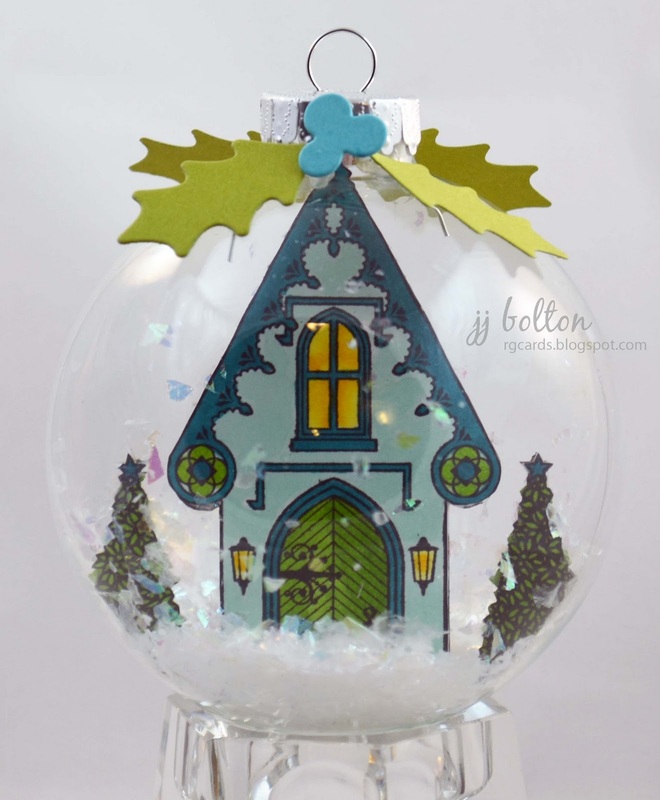 Your coloring is amazing, and to feature that sweet cottage in a real ornament is such a creative idea! This would make a wonderful gift. How cool would it be to have a whole little tree of colorful cottages? Eek! Your coloring is AMAZING! OMG, this is AMAZING! What a fabulous and wonderfully creative idea! It is so worth any mess it caused! Your coloring is great and love that you did both sides--and with different colors too! I think you have a definite winner here!! WHAT??? WOW!!! I don't have words! These are AMAZING - so creative and so so beautiful! These are so adorable! 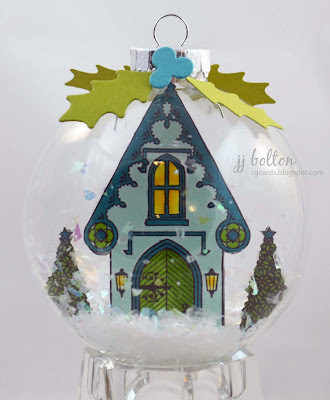 What a creative idea to use the cute little cottage inside .. its like an upside down snowglobe! I'm with Kelly - these would make great gifts! These are amazing! Love how these little Christmas cottages look all nestled in snow...and what CUTE ornaments they are! Amazing job. These are wonderful!!! 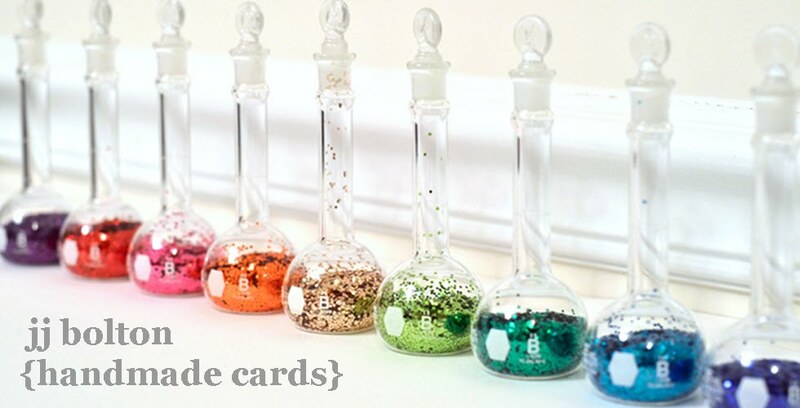 Have some of those ornaments but, never tried...yours are perfect!!! Oh my goodness! Hands down, these are my favorite little handmade ornaments I've seen all season! I sooooo want to make these now with my kiddos this weekend. They would love to create something like this. Thanks so much for sharing how you put the image inside the ornament - I would have never thought to roll it up. This si awesome. Love the cottage placed inside the glass. so very pretty.....hope you have a super fun weekend! Gorgeous!! Your tree will look so pretty with those in it. Thanks for joining us at wmsc. JJ, I told you this would be a winner! Congrats on winning Top Mouse this week! These are stunning! What fabulous projects!